The absolute protagonist of this canvas is the Sun King, who governed France from 1643 to 1715. He was only five years old when he took the throne after the death of his father, Louis XIII, but the early years of his reign were under the regency of his mother, Queen Anne of Austria (1601-1666), who was the sister of Philip IV of Spain and of Cardinal Mazarino (1602-1661). The image is completely military and its intentionality is clearly political-dynastic. The monarch appears in a landscape with a battle in the background -the siege of Namur, painted by Joseph Parrocel (1646-1704)- that marks the last time the king led his armies. He wears French cavalry armor decorated with fleurs de lis of a type that was normal in the 17th century. His helmet rests on a stone on which he also rests one end of his command baton, which has the same decorations as his armor. He wears a general’s cummerbund and the sash of the Order of the Saint-Esprit across his chest, with the plaque hanging against his left side. This elaborately martial appearance does not stop him from wearing a high and dark wig of the sort then in vogue and his air of distinction combines a blasé self-confidence with an aura of majestic distance, all of which is reinforced by the authority conveyed by his gestures. He firmly grasps his command baton in his right hand while resting he left on his hip. This is one of a series of portraits of male members of the French royal family, including the Grand Dauphin, Louis; the Duke of Burgundy and the Duke of Berry, of which there are replicas in various collection. All of these figures appear armed and were painted by Rigaud, except for the last, which was by Nicolas de Largillièrre (1656-1746). They were probably conceived to emphasize the roles of the grandfather, father and brothers of the Duke of Anjou, the future Philip V, as defenders of his right to the Spanish throne in the internecine War of Succession (1701-1713). The origin of the present work’s commission is relatively complex. The French sovereign asked Rigaut to portray him in majesty, with all the symbols of his monarchical consecration, in a work to be sent to his grandson, Philip V. The latter was so pleased with its pompous composition that he requested a replica for himself, which he wanted to hang at Versailles. 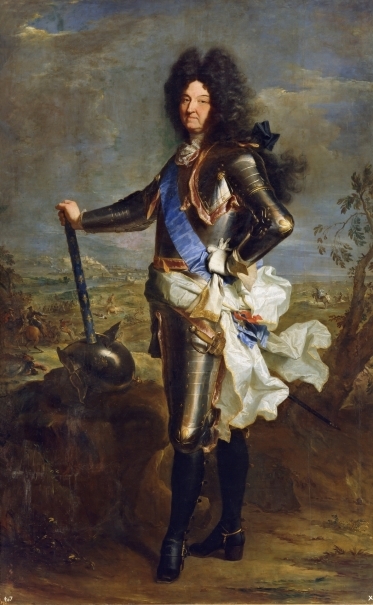 Over time, that likeness (now at the Musée du Louvre in Paris) has become the most popular image of Louis XIV. However, he may have reconsidered, reaching the conclusion that Philip V was as much a king as he, and that such a grandiloquent canvas steeped in royal spirit might not be appropriate for the court in Madrid. Therefore, because of their French arrogance, he did not send either canvas. Consequently, he ordered the present work, which is based on the earlier one, but clearly martial in its presentation. In fact, this painting was made by Rigaud with considerable participation by his workshop. The king’s face is attributed to him -this is immediately clear when studied under oblique light- while his assistants are thought to have painted the rest -armor, vegetation, landscape, clothing, etc.- notwithstanding a few final touches by the master to add special qualities to a few details. Certain researchers believe, with no documental basis, that this canvas was painted earlier, and that the signature may have been applied several years after its completion (Text drawn from Luna, J. J.: El arte del poder. La Real Armería y el retrato de corte, Museo Nacional del Prado, 2010, p. 252). Height: 238 cm. ; Width: 149 cm. Inventario de La Granja. 1814, Madrid, 1814, pp. 23. Inventario de las Pinturas del Museo Hecho a la Muerte del Rey, Texto fotocopiado, Madrid, 1834, pp. 70. Lefort, Paul, Les Musees de Madrid. Le Prado, San Fernando, L'Armeria, Gazette des BeauxArts, Paris, 1896, pp. 183. Museo Nacional del Prado, Museo del Prado: catálogo de las pinturas, Museo del Prado, Madrid, 1985, pp. 560-561. Fernández Miranda y Lozana, Fernando, Inventarios Reales. Carlos III. 1789-1790. Vol. I, Patrimonio Nacional, Madrid, 1988, pp. 32. Buendía, José Rogelio, El Prado. Colecciones de Pintura, Lunwerg Editores, Barcelona, 1994, pp. 510. Bettagno, Alessandro, El Museo del Prado, Fonds Mercator Fundación Amigos del Museo del Prado, Madrid, 1996, pp. 549. Posner, Donald, The genesis and political purposes of Rigaud's portraits of Louis XIV and Philip V, GAZETTE DES BEAUX-ARTS: LA CHRONIQUE DES ARTS, 131/2, 1998, pp. 85/ lám.6. El arte en la corte de Felipe V, Fundación Caja Madrid Patrimonio Nacional Museo Nacional del Prado, Madrid, 2002, pp. 436. Aterido Fernández, Ángel; Martínez Cuesta, Juan; Pérez Preciado, José Juan, Colecciones de pinturas de Felipe V e Isabel Farnesio. Inventarios Reales, II, Fundación de Apoyo de la Historia, Madrid, 2004, pp. 455. Louis XIV : l'homme et le roi, Skira Flammarion: Château de Versailles, 2009, pp. 204-395. El arte del poder : la Real Armería y el retrato de corte, Museo Nacional del Prado: Socied, 2010, pp. 252-253. Castillo Álvarez, Silvia, Marcos, muebles y maderas: obras de carpintería, ebasnistería y enmarcado en el Museo del Prado (1818-38), Boletín del Museo del Prado, XXXIII, 2015, pp. 100-111 [109 f.8]. James-Sarazin, Ariane, Hyacinthe Rigaud, 1659-1743, vol I L'homme et son art, Éditions Faton,, Paris, 2016, pp. 128-135,146-163. James-Sarazin, Ariane, Hyacinthe Rigaud, 1659-1743, vol II. Catalogue raisonné, Éditions Faton,, Paris, 2016, pp. 262 P774. Inv. Felipe V, La Granja, 1746. Núm. 407. Inv. Testamentaría Carlos III, La Granja, 1794. Núm. 407. Inv. Fernando VII, La Granja, 1814-1818. Núm. 407. Inv. Real Museo, 1857. Núm. 986. Rigaud (Jacinto) / 986. Retrato de Luis 14, en pie. / Esta el príncipe armado, con la cabeza descubierta, con banda azul y faja blanca. / Alto 8 pies, 6 pulg; ancho 5 pies, 4 pulg. Catálogo Museo del Prado, 1873-1907. Núm. 2072. 2072.-(986-I. )-Retrato de Luis XIV, de pié en el campo, vestido con su arnés de guerra, la cabeza descubierta, y apoyando el baston de mando en el yelmo. Lleva faja blanca de pomposo lazo, y al pecho la banda de la órden del Sancti Spiritus.-Figura entera, de tamaño natural. Col. de Felipe V, Pal. de San Ildef., de donde vino para la formacion de este Museo en 1827.-F.L. / Alto 2,57; 1,49.-L.
Armor: Luis XIV con armadura francesa de caballería, sembrada de flores de lis, siguiendo la tipología normal del siglo XVII, con el casco sobre una piedra, encima del cual también apoya el bastón de mando flordelisado (Luna, J. J. en: El arte del poder. La Real Armería y el retrato de corte, Museo Nacional del Prado, 2010, p. 252). Baton, Command: Bastón de mando flordelisado. Order of the Holy Ghost: El rey con banda de la Orden del Saint-Esprit, cuya placa pende a su costado izquierdo.